In phase three, finding jobs for homeless is job No. 1. (Al Hartmann | The Salt Lake Tribune) Maurice Egan, director of The Other Side Academy and members of the State Homeless Coordinating Committee meet in the Salt Lake City Police sub-station at 420 W. 200 S. to announce a third part of Operation Rio Grande, "Dignity of Work" program to employ the homeless. Steve Starks, president of Miller Sport Properties, (Utah Jazz), left, is spearheading the effort. The architects of Operation Rio Grande said goodbye to the “War Room” this week as the two-year campaign to improve homeless services entered its third phase, which focuses on linking homeless residents with jobs. The room with large windows overlooking 200 South had been dubbed the “War Room” by House Speaker Greg Hughes, a place where state and local officials could meet and craft a plan to address years of crime in the neighborhood surrounding the state’s largest homeless shelter, The Road Home. On Thursday, Hughes and Lt. Gov. Spencer Cox renamed the hub “Work Room” as the state points resources toward identifying people who are ready for jobs and others who may need help before they can get them. (Al Hartmann | The Salt Lake Tribune) Lt. Gov. 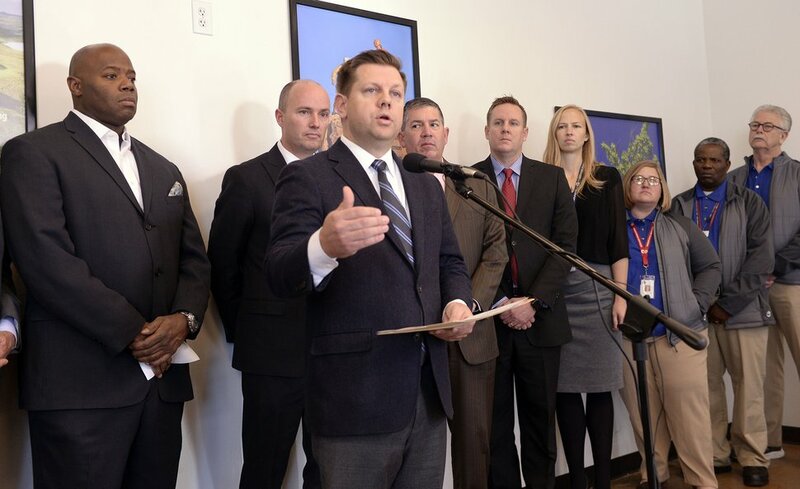 Spencer Cox and members of the State Homeless Coordinating Committee meet in the Salt Lake City Police sub-station at 420 W. 200 S. to announce a third part of Operation Rio Grande, "Dignity of Work" program to employ the homeless. 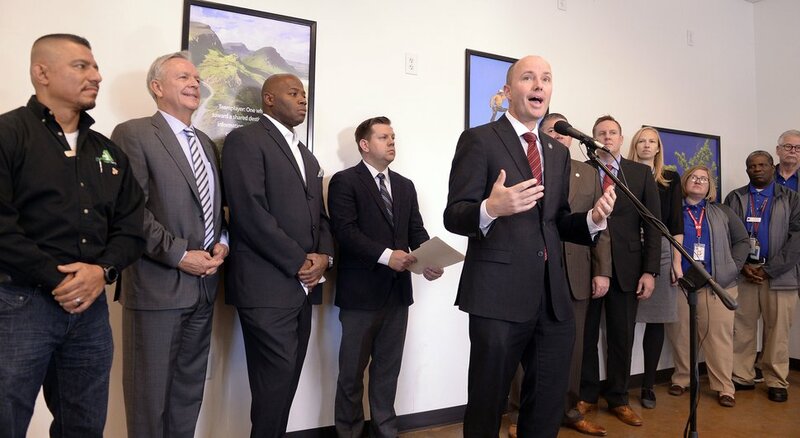 When the operation’s leaders realized they would make linking residents up with jobs the third leg in their campaign, Cox said he thought of Steve Starks, president of the Utah Jazz and Larry H. Miller Sports & Entertainment. “I called him and said, ‘I know you have a million things on your plate, but I have a favor to ask you,’” Cox said. Starks agreed to become the point person for finding ways the state can help find jobs for homeless residents and assist in addressing issues that can lead to unemployment and homelessness. State caseworkers are tasked with identifying which residents are already trained and ready for jobs. Others may need long- or short-term support, like treatment or training, before they can keep jobs, Starks said. There will also be daily workshops and meetings at the Work Room. The effort is to be tested as soon as next week. Okland Construction agreed to find 10 homeless people to work on a project in the Rio Grande area. 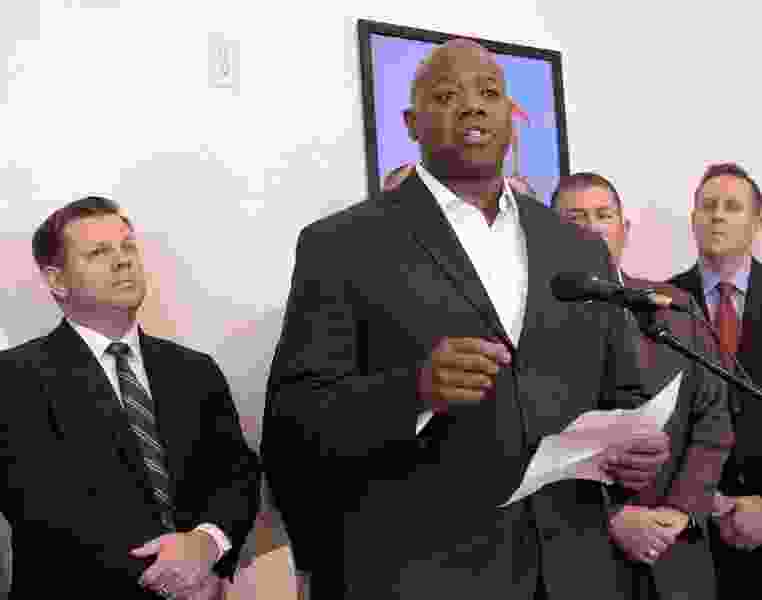 Typically, though, the state is hoping companies will hire one or two people at a time, and Starks invited any company to step forward. “We know the job market right now is tight, so people are looking for employees,” Starks said. That includes Vivint Smart Home Arena, home of the Utah Jazz. (Al Hartmann | The Salt Lake Tribune) Steve Starks, president of Miller Sport Properties, (Utah Jazz) and members of the State Homeless Coordinating Committee meet in the Salt Lake City Police sub-station at 420 W. 200 S. to announce a third part of Operation Rio Grande, "Dignity of Work" program to employ the homeless. Starks said he was at the Weigand day center about a month ago and met a man who had his food handler’s permit but no job. Starks said the two went to a job fair and the man was hired. Standing among the group Thursday was Maurice Egan, a man who was once homeless and suffering from addiction in San Francisco. While he was homeless, he said, he was offered housing and a job, but he was still doing drugs. By having state workers visit with residents who are out of work and building profiles on their needs, the state hopes it can help prepare them for success before linking them up with a job. The new phase begins as the state continues racking up arrests — more than 2,000 since Operation Rio Grande launched Aug. 14. The state also received approval this month for federal Medicaid funding that is slated to help pay for treatment for several thousands of single childless adults. The state will track how long people stay at The Road Home and will follow up to determine whether those people get housing after leaving the shelter.